So the holiday is booked, your passport is valid now all you have to do is find your swimwear. Sadly the diet didn’t quite get going and you aren’t looking forward to bearing your body on the beach or beside the pool. What you need are a few confidence tricks that will help you look and feel your best. A beautiful beach bag – you can always place this strategically in front of your tummy until you lie down! 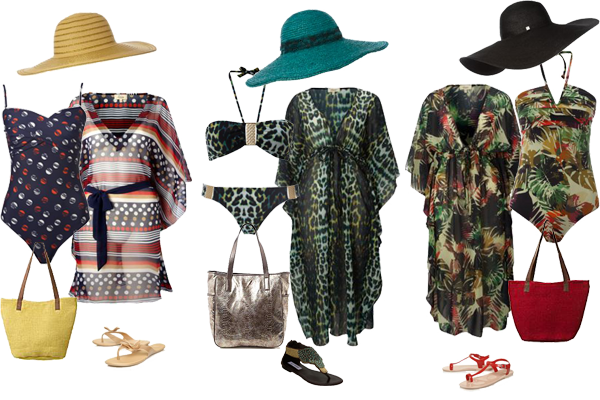 And always have a great coverup, whether that be a sarong or kaftan, to wear when heading to the beach bar. 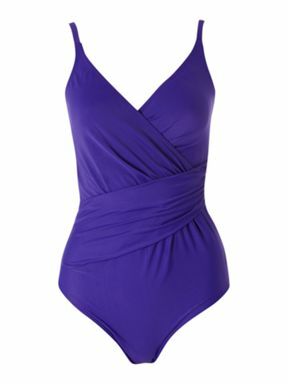 Always choose a swimsuit or bikini with support designed for the larger bust. Good make to look for are Fantasie and Freya who both do cup sized bikini tops and you can buy the tops and bottom separately to ensure a good fit. If you want to make a small bust look fuller, go for a padded bra top in a bright colour and make sure it fits well. Or give the illusion of greater width with a stripe. Draw the attention upwards with frills or detailing at the bust, or a darker colour on your bottom half. If it’s your tummy you are worried about wear a one piece and again draw the eye up with bust detail or wear a swimsuit with ruching to conceal. Have you chosen your beachwear yet? Do you have any favourite brands that you always return to – I’d love to know. Because I got to see a lot of women in swimsuits. And they were not all a pretty sight.